On the 1st of October, 2012, the students of the University of Silesia and the University of Economics in Katowice gained a completely new learning space – on that day, the Scientific Information Centre and Academic Library (Polish acronym CINiBA) was opened. The building designed by the Koszalin studio HS99 had to wait nearly 10 years for completion – the competition for the design had already been decided in 2003. Judging by the dozens of awards that the completed structure has won, it was worth the wait. The Katowice university campus is located in the very centre of town, near a loud and busy highway named Walenty Roździeński Avenue. The campus is a still unfinished complex of buildings from various eras, which nevertheless are mostly modernist in style - the tall, large-panelled blocks of the neighbouring dormitory; the light, pavilion-like buildings of certain faculties, and the concrete, steel, glass, bricks and coloured mosaics appearing on the facades. On the other side of the street there are rows of ornate tenement houses from the end of the 19th century and the beginning of the 20th century. The designers of CINiBA had to design a structure that would fit into these specific surroundings, taking into consideration the complicated context in which the new building was to be erected. It’s worth mentioning that the architectural competition stipulated the building of a library only for the University of Silesia, the idea for it to also provide services for the students of the Academy of Economy appeared much later. Consequently, the architects from the victorious team HS99 had to change their vision to meet the new requirements. The university campus in Katowice is located opposite an area that has been undergoing a gigantic metamorphosis over the past years. In the area to the east of the famous Spodek, the huge Congress Centre (design by JEMS Architekci), the modern Silesian Museum (design by Riegler Riewe Architekten) and the building of the Polish National Radio Symphony Orchestra (design by Tomasz Konior) are being erected. Unfortunately, the neighbouring cultural and scientific areas are divided by the canyon of the multi-lane highway, which is lined with sound walls. 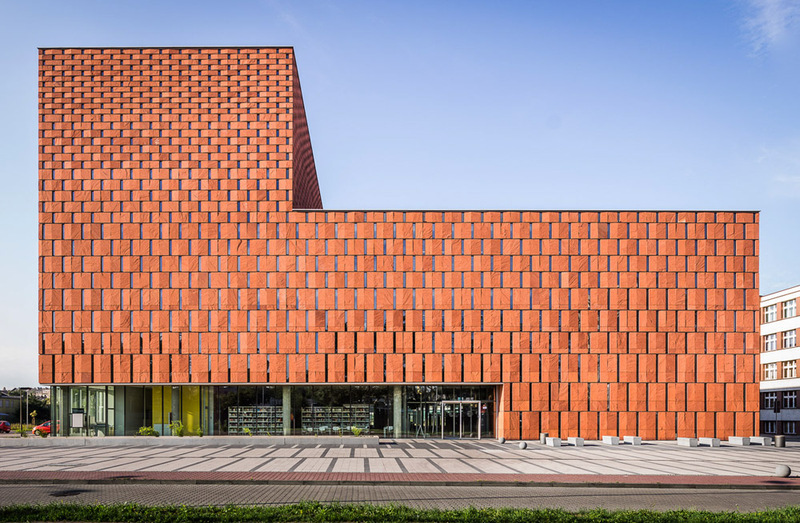 Dariusz Herman, Wojciech Subalski and Piotr Śmierzewski, the designers of the Katowice library, gave it the shape of two cubes – the first one is bigger and lower than the other, the second is twice as high as the first but is smaller than the lower cube. The entrances, which are located in two opposite corners of the building, are marked by elongated glass elements. The rest of the edifice seems to be a compact, monolithic solid. The most vivid and at the same time the only characteristic element of this solid is the facing of the façade. All of the exterior walls of the building were covered by vertically set rectangular panels made from Indian sandstone. The intense, “ginger” colour and the rough surface may be associated with the brick walls of historical Silesian tenement houses or industrial buildings. The orderly, rhythmic arrangement of the panels divided by very narrow vertical windows (of which there are over 4000) – is a tip of the hat to modernism, which favours simplicity and geometric order and has left its mark on Katowice. The minimalistic and at the same time characteristic body of the library is the quintessence of modern architecture which eagerly makes use of simple means. The stone used to cover the façade was chosen very consciously by the architects. The stone’s colour, texture and qualities strongly influence the look of the building. The split texture and the manner of setting of the stone cause the façade to look different at dusk than in sunlight. The façade looks different when it is wet and when it is dry, it looks different in the summer and in the winter, from up close and from afar – Piotr Śmierzewski from HS99 emphasized in an interview for the weekly Polityka. 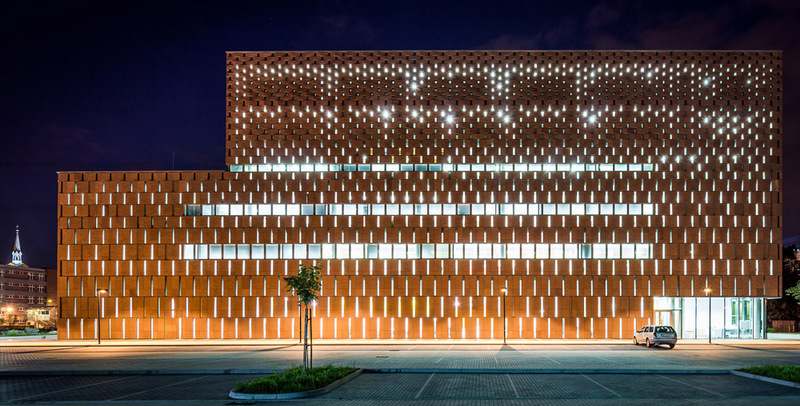 Thanks to the dense arrangement of narrow windows, after dark the building resembles an abstract sculpture, or a mysterious lantern glowing with thousands of crevices. The interior of CINBiA is no less raw. In this interior, concrete and steel are predominant. The rhythmic arrangement of bookcases and work tables is supplemented by partition walls, lamps and panels masking installations and cables, which were set with similar geometric precision. This orthodox order is “brightened” by wooden details, floors and balustrades and stairs, which are the only elements in this space to have been given the shapes of gently bending arches. This is a symbolic presentation of history: of the Prussian Kattowitz, the capital of a region of the 2nd Republic of Poland, Stalinogród, the socialist-modernistic centre of progress in the times of communist Poland and the city’s newest tendency to aim for the idea of a metropolis of knowledge, science and culture – wrote the expert on and researcher of Silesian architecture Ryszard Nakonieczny in the monthly Architektura-Murator. The architects from the studio HS99, who usually work in faraway Koszalin, managed to truly sense the spirit of the capital of Upper Silesia. They also managed to skilfully integrate the building, which is a modern interpretation of tradition and the region’s characteristic qualities, with a diverse and slightly chaotic space.